I didn’t expect it at all since I have to admit in the last months I neglected a bit Euro Coins Pocket Collector, the software I made for Euro coins fans. I actually chose to honor the priorities of my work as consultant and custom software developer. So I was pleased to know that even this year the judges of the Best Software Awards 2006, the competition organized by the american Smartphone and Pocket PC Magazine, confirmed the value of the software and it was included among the finalists in the category Miscellaneous Utilities, just as they did last year. Anyway, it’s a pleasure that an atypical software, made from work and passion, reachead the final selection of a contest that gathered only the 20% of the best software existing for the Windows Mobile platform. The winner of the Miscellaneous Utilities was StyleTap, an emulator useful to run applications written for the PalmOS on Windows Mobile devices. Two intense days made the weekend fly more swiftly than usual. On friday I attended the Touristech event in Villa Erba and I spent most of saturday in Verona at the Veronafil philately and numismatics fair. Touristech is the first event organized by Wireless dedicated to new technologies and digital innovation at the service of the cultural entertainment and hospitality services for tourists. For this meeting they couldn’t choose a better location than the beautiful Villa Visconti, located in the Villa Erba park in Cernobbio. It has been a long time since I had the chance to walk in that park, although I’m often in Cernobbio, and I hadn’t remembered how pleasant and relaxing it is. In fact it was the first time I wasn’t tired when I went home after a day full of conference presentations instead of what usually happens after similar events organized in Milan. I met Paolo Conti, a journalist of Il Sole 24 Ore, the brilliant moderator of the recent Mobile Force & Office Forum 2006 and we had the chance to talk about the project. After a morning of presentations by representatives of the major players of the tourism market in Italy, such as Touring Club among the others, the event closed with a series case histories of mobile technology applied to outdoor journeys, such as the PDA guide they’re experimenting with at the Villa Reale Park of Monza and the PDA guide currently in use at the Swiss National Park. My focus were Euro coins of course, and I had the chance to meet some users from the LaMoneta.it Italian forum, but unexpectedly I came back home with a surprise as much as precious: I managed to get the Green Vespa, the only Vespa model ever made for the famous Kinder surprise toys series! That was the first question an talian voice asked me when I got a call from Austria’s ICNM a few weeks ago. I didn’t remember exactly where I read about it, but it was certainly in the news of a website. The italian manager told me they were having difficulties spreading the word about the contest in Italy, so any help or suggestion would have been welcome. It’s a marketing job I think, and that might not be a trivial task, even if you put it in the hands of a professional. In fact from a total of 411 submitted projects there were only 18 participants from Italy. None of them has been selected in any category or even mentioned in the printed publication they sent me, but what surprised me the most has been the quality and the number of submissions from Eastern Europe countries. Talk about lack of competitivity there! I entered the contest submitting EcPc, including a beta of the PC version. They didn’t have a Pocket PC to test the software, so I had to send them my Axim X3 and when they returned it I risked to loose it because some smartass tried to stole it at the post office in Como, really! The final selections of the jury in the mobile contents category are good projects, but personally I don’t find anything special in soccer related management software or in Wi-Fi mapping utilities. That’s my opinion of course, the jury evaluated the projects using a number of different criteria. Congratulations to the winners then, most of them presented interesting projects. A few months passed since the last blog post, time I actually spent working in silence, trying to reach the mental state in which I’d been able to defeat the so-called information overloading, that can easily affect workers in the ICT sector (and not only us). Now I’m still busy working on the innovation project committed by a local company and coordinated by the Centro Volta. It’s going well and I’d like to write more about it, but I’ll do it only if I’ll get the necessary permissions. Since the beginning of the year I’ve also started working on the software project for which I committed a due diligence study to the Centro Volta last year. I had the luck to find the right people with the right competences for this project and we’re doing well I’d say, a confirmation of the fact that the people always make the difference. The last year ended, and the new one began, with a present from Smartphone & Pocket PC Magazine. 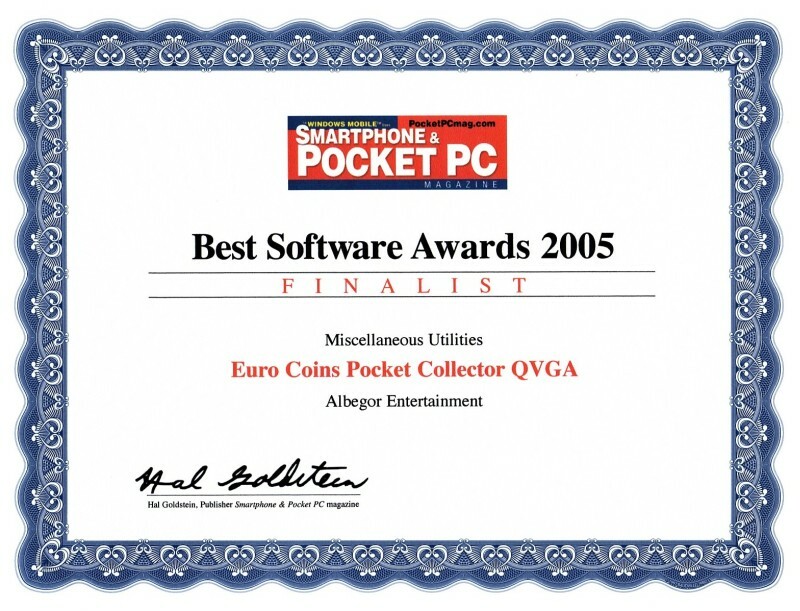 Their Board of Experts voted Euro Coins Pocket Collector QVGA to be among the best in the category Miscellaneous Utilities in the magazine’s fifth annual Best Software Awards. As a finalist I joined their 2006 Best of Everything Marketing Program which will grant my software some more visibility. Another award that makes me proud of the work I did and talking about this I can anticipate that in a couple of weeks I’ll start building a new site entirely focused on Ecpc. So we are at the end of the year and it’s time to sum up what’s happened in the past 12 months and to make new wishes for the future. Lots of things happened since the last blog post. I’ve been busy working on new software projects for the so-called vertical markets, which relegated the work on the new version of Ecpc to a niche of time, but I couldn’t be more glad closing this year by mentioning that Ecpc was a finalist in the Best Software Awards 2005, the annual competition of the american Smartphone and Pocket PC Magazine. Hers was a consideration about the frenzyness of modern life compared to how things went at her times. I often think about it when I’m not be able to keep up with emails or reading all the newsletters. Sometimes I think to be suffering from the so called information overload. With this little pearl of ancient wisdom I wish you a happy celebration of the New Year! I attended the presentation held by Hal Goldstein and Diane Dumas at the recent Handango Partner Summit 2005 about advertising on Pocket PC Magazine, but I hadn’t the opportunity to talk to them face to face. Maybe they should add a new category in their Software Encyclopedia, Hobby or Educational. In the meantime I just completed a submission for the Top Talent Award 2005 and I’ll be patiently waiting for the outcome of this interesting european contest. Also I’m glad to announce that a beta of the Smartphone version of EcPc, which I called EcSp :), is up and running on my Motorola MPx 200 and I’d like to invite you to get a look at some pics and screenshots in the preview I posted in the forum. I’m now working on some minor improvements and according to how many of them I’ll be able to introduce, I’ll decide if a new point release deserves its name, thus making the software version up to 1.6, or I’ll just release the Smartphone version as 1.5. Euro Coins Pocket Collector Second Birthday! The design of the 2 Euro italian commemorative coin on the left, celebrating the fifth decade of the World Food Program, contains a very curious detail: as you can see there are an ear of wheat, an ear of maize and an ear of rice emerging from behind the globe. They’re the three grains representing the world’s basic sources of nourishment, a bit like the three elements needed to produce quality software I put on my business card: creativity, experience and passion. Thank you all the users of the Pocket PC version of the software and to all the people who supported it in a way or the other! I’ll activate a promotion in a few days so that it’ll be possible to purchase EcPc at half the price, both the QVGA and the VGA versions. On last thursday I attended the eContent Award Italy award ceremony in Palazzo Turati in Milan. I submitted EcPc for evaluation, although I haven’t been able to send the all the materials they required due to the trip to Miami, so it was only mentioned in a presentation of all the submitted projects. They selected mostly websites, many of which well worth it, but what did really disappoint me was the usual italian way of doing things… I’d better not comment on some aspects of the ceremony because I know I would appear much more evil than I am, but I’d like to share a tip to the creative people, young or not, working on their projects in Italy: don’t limit yourself to a local or national market for your work, think internationally since the beginning, otherwise you’ll waste your time complaining about the lack of resources, investors and so on… and you’ll end up leaving your dreams incomplete. Update: the 50% off offer is active and you can access it directly from the Buy EcPc page. It’ll expire on august 1st, so… hurry up! You are currently browsing the archives for the Euro Coins Pocket Collector category.